A few weeks ago, Trinoma held an “Eraserheads Tribute Concert” featuring the top Filipino bands playing Eraserheads songs in their own rendition. It was an exciting time and I was there throughout the concert. Now, Trinoma has gone one more level and held a concert for Ely Buendia himself, singing the Eraserheads songs we all know and love. It was one thing to wax nostalgic from hearing these songs from well-known artists, but a totally different matter when the song is coming from the source. Anyway, I had three cellphone batteries at hand (my cellphone battery has failed before) and I had bought a ticket to get into the seating arrangement at the center of the Activity Center. It was jam-packed with people by the time I got there, but I was able to squeeze in at a perfect spot to record with my camera phone. It was amateurish, compared to Tablets I was seeing being waved around by the crowd, but it was good enough for me. 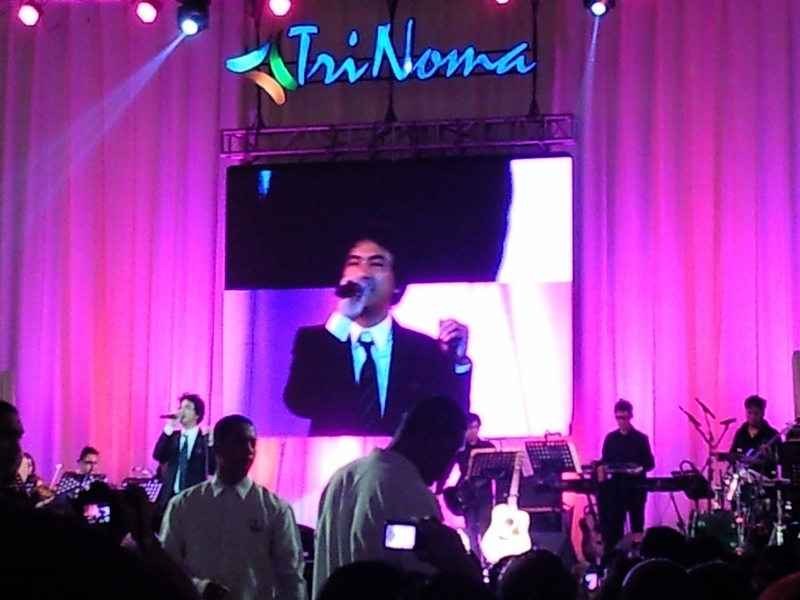 Ely Buendia opened the show with Alapaap. He alternated between well-known songs and songs he performed post-Eraserheads. The latter was sprinkled in. He sang Wanted Bedspacer along side such favorites as Ligaya and Tikman. Of particular note is his rendition of his own song Magasin: mixed in with violins, and an acoustic piece. One thing of concern, though: Ely seemed different. He preferred not to take the high notes, opting for the bass pitch when he could. But he did reinvent his songs, to much success. I was able to get them, except for those new songs of his, and tragically the last song in his performance. Yes, friends, he capped the performance with Ang Huling El Bimbo, and that was when my battery conked out. What timing. I did get a good first part of the song, and took a video of him mingling with the crowd. By the time I was ready to film Part 2 (with a new battery, also near to dying), it was almost to the end already. He left during the guitar riff of the El Bimbo song, and some of us were clamoring for more. As for me, I looked for a nearby place to eat. Coming back, I noticed that there were still a large group waiting on the back. They were waiting for Ely to come out and for them to catch a glimpse and last photo of him. I joined in. And after some wait, he came out and headed straight for the exit, flanked by security. That blur in the blue shirt is Ely. So I don’t make a good papparazi. Sue me. And that was it. The Eraserheads have made a mark twice in August-time for Trinoma. And I was there in both instances. Next time, I’m bringing an exceptional battery. Five batteries.